Summer is now upon us and for me, that means road trips. There’s something about the change in season that stirs an almost irresistible urge to climb in the car and drive. One of the ways I get my summer road trip fix is through epic day trips. One of my favorite things about going on day trips in Washington is how quickly you go from one environment to another. This state has it all: mountains, beaches, deserts, rainforests, bustling cities, and sleepy little towns. 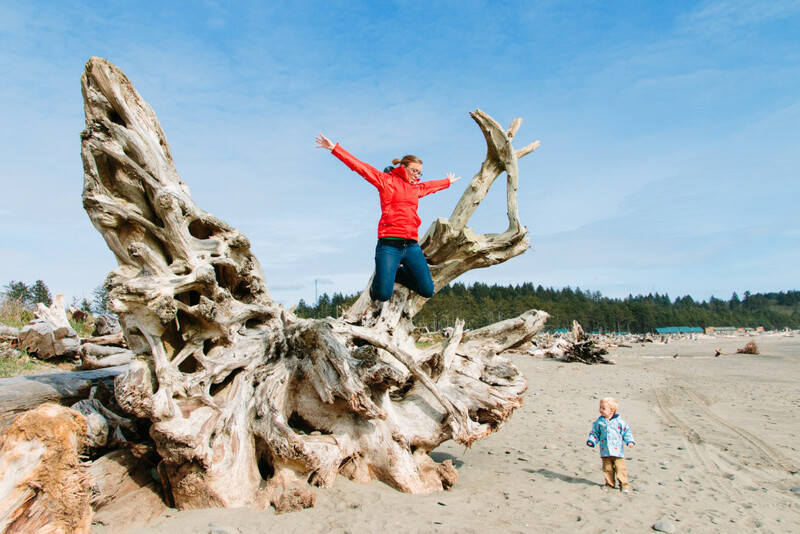 It isn’t hard to wake up in your bed in the foothills of the Cascade Mountains, cross the Puget Sound on a ferry, skirt along the edge of the Olympics, dip your toes in the Pacific Ocean, and still make it back home in time to go to sleep in your own bed. If the phrase “epic day trip” conjures up images of being stuck in the car with your kids all day, read on. 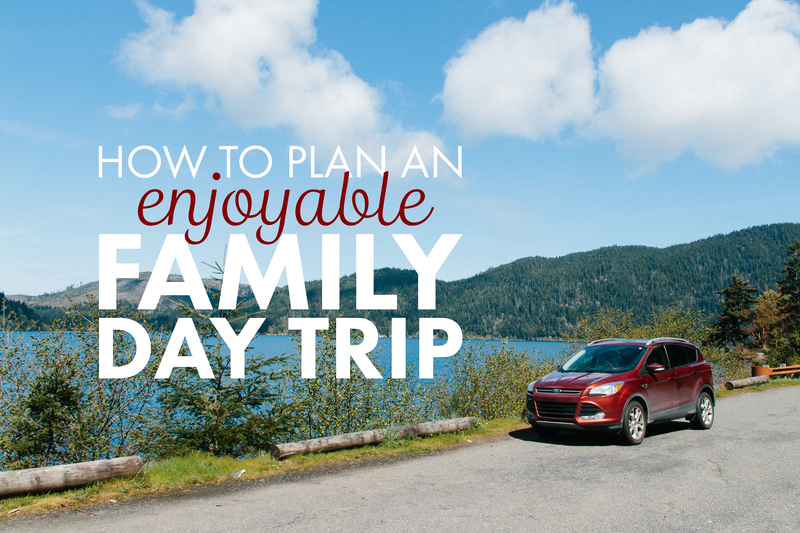 Planning an enjoyable family day trip is easier than you think. Choose a destination. If you are just starting out or if you are unsure of how your little ones will react to being in a car for an extended amount of time, aim for places that are about two hours away from home. If you feel up to the challenge or need your road trip fix, look for places about four hours away. Personally, I don’t go any farther than four hours from home for a day trip. If your destination is more than two hours away, take a close look at your route and try to find fun and relaxing places to stop along the way. Aim to spend no more than one to two hours in the car at a time. Use Google Maps to brainstorm possible pit stops. The possibilities are endless. 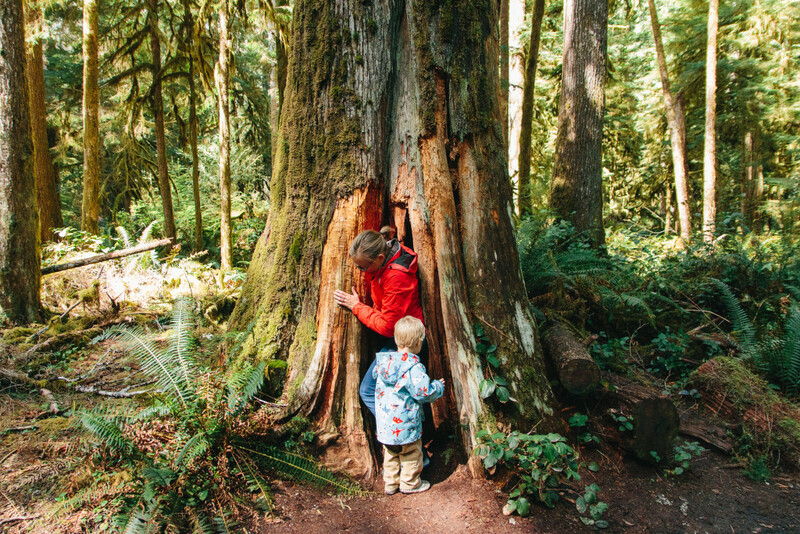 Parks, trails, picnic areas, museums, historic sites, quirky restaurants, coffee shops, ferry rides… just get out of the car and play! Avoid the temptation to hit the drive thru or to just gas and go. Breaking up your drive will obviously add more time to your trip and take away from the time you will be able to spend at your destination, but the point of this method of traveling is to enjoy the day as a whole. What I love about taking frequent, fun breaks is how varied your outing can be. In the span of one day, you can ride on a ferry, hike to a waterfall, have a picnic on the lake, drive through the mountains, and chase ocean waves as they roll across the beach. The breaks you take not only help you recharge and keep your little travelers happy; they are destinations in and of themselves. My all-time favorite day trip is my recent drive from my home in the foothills of the Cascades to Washington coast. Weeks later, the memories made on this trip still bring a huge smile to my face. 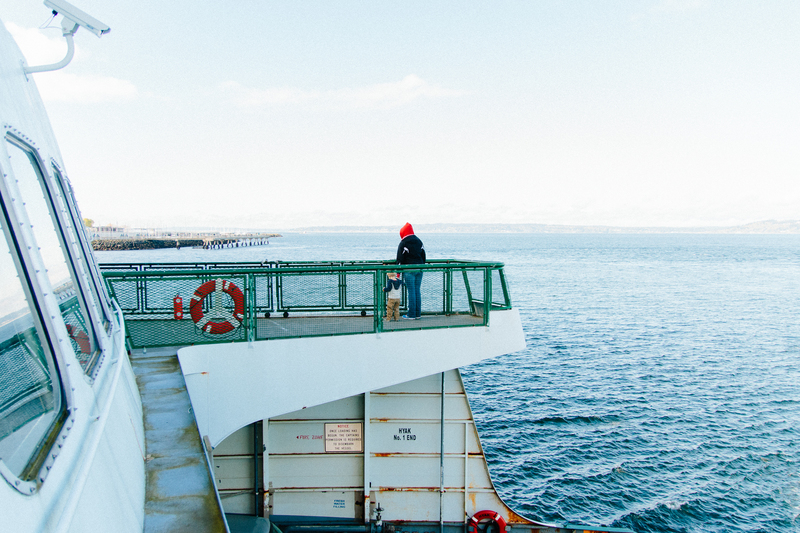 Pit stop number one: crossing the Sound on the Edmonds-Kingston Ferry. 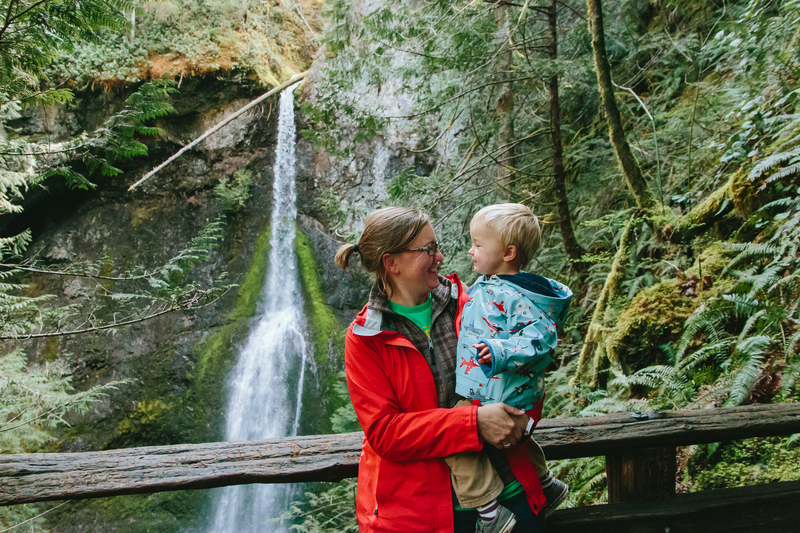 Pit stop number two: hiking to Marymere Falls in Olympic National Park. 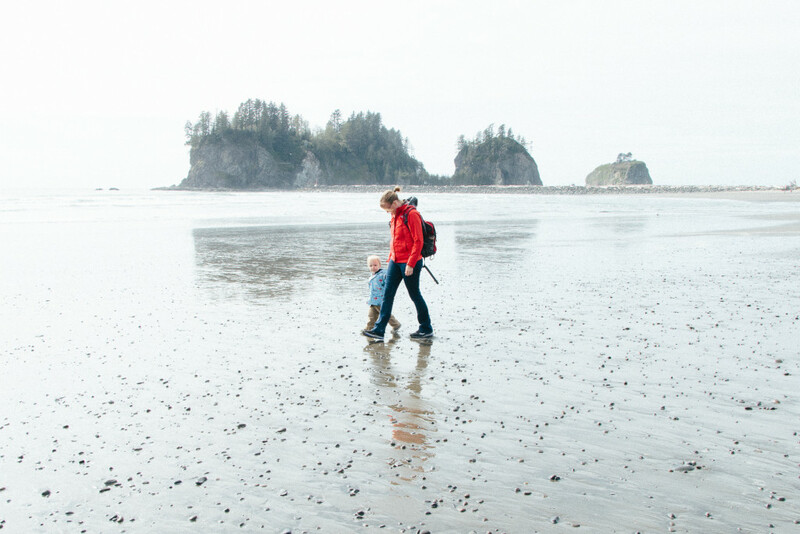 Destination: beach combing at La Push and Rialto Beach on the Washington coastline. Bring food and a blanket for a picnic at a park or a lake. Go for a short hike or nature walk. Stop at the beach for a snack and some beach combing. Ride a ferry (and for heaven’s sake, get out of your car!). Eat a late breakfast at a small town diner. Go to a park and toss around a frisbee or play catch. Stop at a river or a creek and throw rocks into the water. Bring bikes, scooters, and helmets for a short ride at a park or nature preserve. Visit a small town museum. Stop at a local playground. Jessie writes from her home in the foothills of the Cascade Mountains. She is a wife and momma on a quest to make every day the best day. She doesn’t live in one place for very long and although she has had many different homes across the globe, Washington is the place that holds the biggest piece of her heart. She is happiest exploring the outdoors with a toddler on her back, a dog leash in one hand, and a camera in the other. 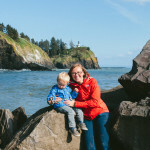 Jessie documents her everyday adventures on link Instagram and her blog, See Luke Go, where she shares stories, tips, and guides to inspire other young families to go outside and explore the world together. That is one of the things I love most about Washington, too! There is such a variety of ‘beauty’ and you can access it all so easily! Awesome photos Jessie! Jessie- this post actually really makes me really want to go on a road trip! Thanks for the inspiration! I’m so glad! The possibilities are endless in this beautiful place!